Hello and welcome to Christmas on Wendhurst. We are Al & Esther Thompson and we are honored by your visit. In talking to many of the visitors at our home during the Christmas season, the main questions are when did you start decorating and why. 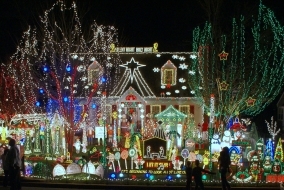 The decorations began in 1999 after we took a limo tour with friends to see the Christmas lights of Richmond, VA. Returning home, Esther proclaimed, "Let’s put some lights on the bushes!" Al’s first reaction was no way because he was working 70-80 hours a week with little time for decorating. Guess who won that debate… lights were put on the bushes. From those first few lights we have grown to our current display. Slowly at first with a single reindeer added in 2000, a second reindeer and 2 spiral green trees in 2001. A few more decorations were added over the next couple years until 2004 when we had a major increase to 93,000 lights. With the added lights came something we did not anticipate; the human side. 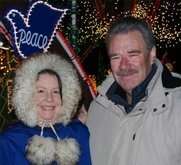 When we switched on the 93,000 lights, we were excited to see people stopping and getting out of their cars. Al said let’s go out and talk to them (he’s a talker). We talked to those first visitors and have been out there almost every night since. We have spoken to people from down the street, across Virginia, the USA, and all over the world. Our Christmases have been made so special because of the people we have met and the friendships we have made.